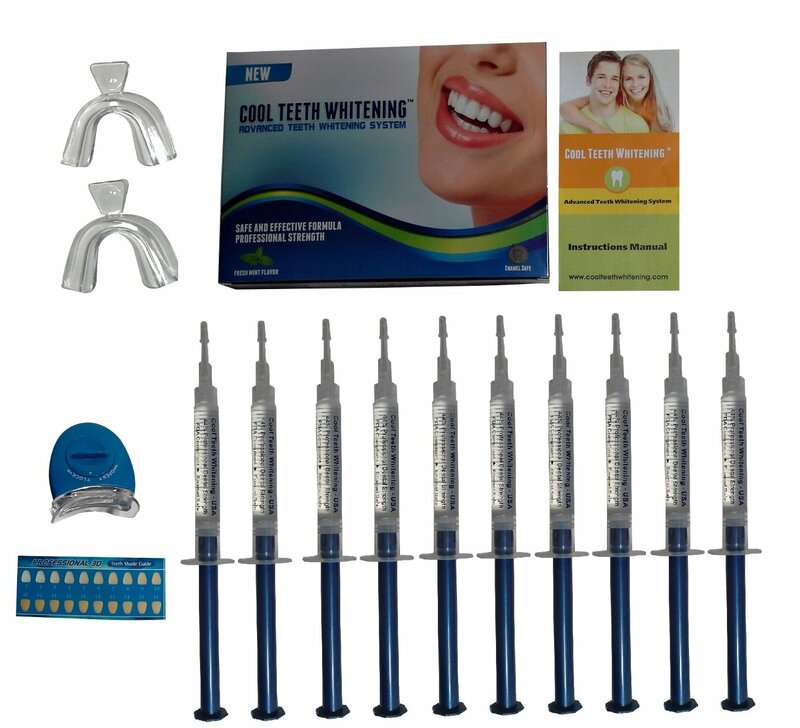 SEALED RETAIL BOX TEETH WHITENING KIT with dental grade 44% Carbamide Peroxide Gel from Cool Teeth Whitening ® – Special High Quality. Same product sold by dentists for 10 x the price. Buy from us save. 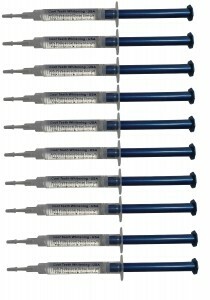 HUGE VALUE – You receive 10 Syringes of 44% Premium Quality Carbamide Peroxide Gel – Professional Strength, Enamel Safe Formula. Exact Same Syringes and Gel Your Dentist Sells. Concentrated Dental Quality Gel Works Great. 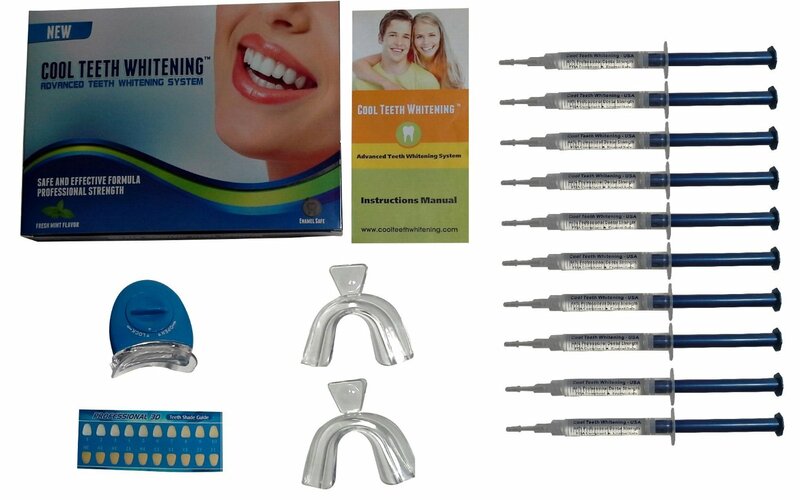 Our teeth whitening kit includes Thermoform MOUTH TRAYS (2 pcs) and a LED Accelerator Light. FASTER results with 10-15 minute Sessions. Step by step detailed instructions and color chart included. 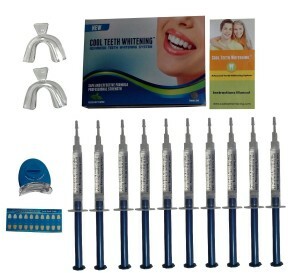 Cool Teeth Whitening ® – 44% Carbamide Peroxide Teeth Whitening Gel. Specially formulated , high intensity gel is manufactured fresh by a Dental lab. You can use half the amount compared to other gels. This is a strong – dental quality – professional strength gel. Our kit comes with 10 syringes of gel + 2 thermoform trays + LED Light + instructions + shade guide color chart. SIMPLE: Our easy to follow instructions will show you how to customize your trays in just a few minutes. Add the gel and you will start seeing results in less than 15 minutes. EFFECTIVE: Using our professional strength 44% Carbamide Peroxide gel, you will remove soda, wine, tobacco, coffee, and tea stains without the expensive in office visits. Our enamel safe formula manufactured by a dental lab will help you maintain your natural shade of white for a long time. FAST RESULTS: Our teeth whitening gel starts working as soon as it touches your teeth. You will start noticing results after your first session. Best results come after a few sessions. ; Our enamel safe dental grade professional strength gel is much more effective than whitestrips, whitening toothpaste, or most of the other whitening products. Our tooth whitening kit gets your teeth whiter in less time (in just 15 minutes) with almost no mess. COMPARE OUR PRODUCT WITH OTHERS AND SAVE. 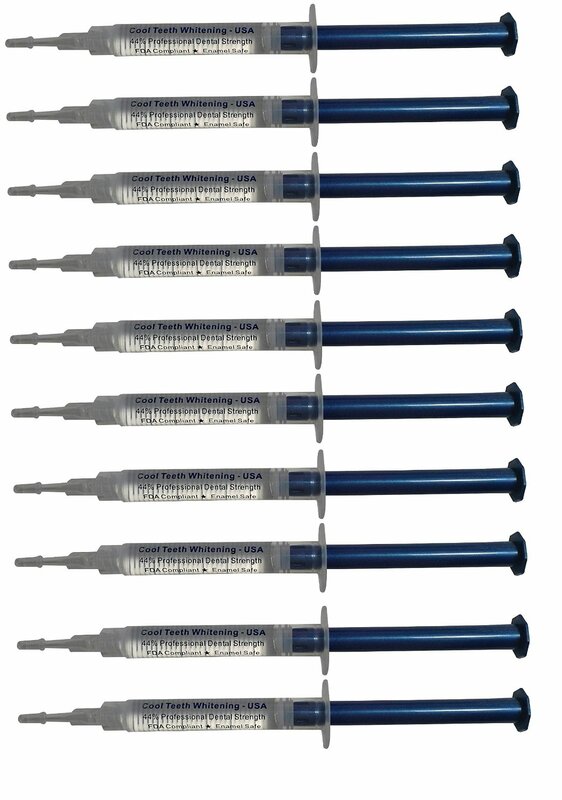 Our complete at home teeth whitening kit provides the most effective whitening power to remove teeth stains, without the use of any bulky machines. 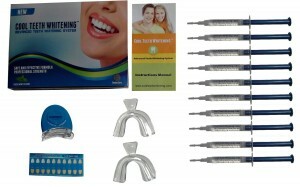 Perfect at home teeth whitening solution, giving you a more confident smile. To avoid teeth sensitivity do not use the gel for more than 15 minutes. And if this is your first time, we recommend starting with a test treatment of 2 minutes. Best way to avoid any type of gum discomfort is keeping the gel away from your gums. If you experience any sensitivity, do not be alarmed. This will go away in 24-48 hours. If you are not happy with our teeth whitening kit for any reason, please return it for a FULL REFUND.